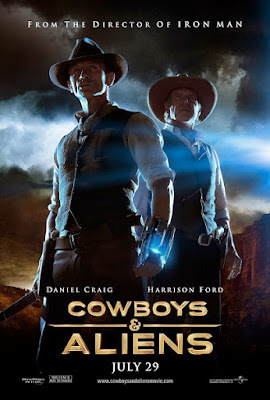 This time we look at a clever form of product placement from Jon Favreau's much maligned Western-sci-fi flick Cowboys & Aliens. Since the scene in question is in fact the last shot of the movie, note that it might be considered a SPOILER. Though it didn't get much respect upon release, I maintain Favreau's film is a fun throw-back to the kind of fantasy flicks we saw from Amblin Entertainment in the 1980s. 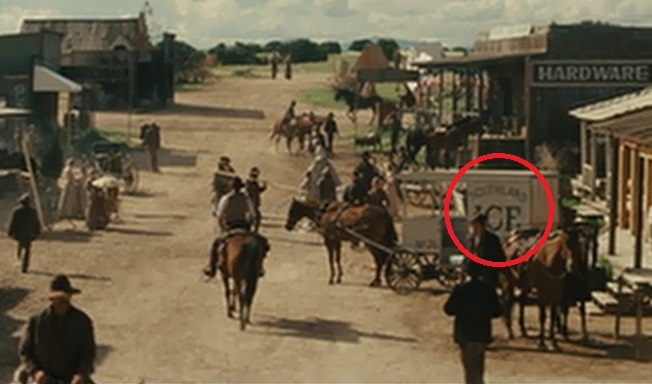 Being a period Western, you'd think product placement would be difficult at best, but the filmmakers managed to pull it off with a bit of historical fun. In the last shot of the film, we get a wide shot of the town of Absolution as lead character Jake Lonergan rides out. Among the bustle of people and businesses, there's a cart parked nearby that reads "Southland ICE." 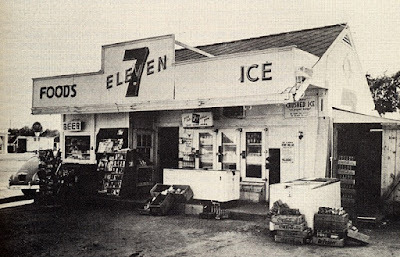 Southland Ice may not be a household name but it would soon give rise to a whole new business model, as Southland employee Jefferson Green began selling groceries such as eggs and milk at one of the company's ice retail locations, giving birth to the convenience store. Southland found Joe C. Thompson, Jr. liked the idea and expanded it to their other locations, eventually expanding their store hours from 7 AM to 11 PM. Thus 7-11 was born. It won't be a surprise to learn that 7-11 ran a big cross-promotion with Cowboys & Aliens, offering collectible Slurpee cups featuring the film's main characters and even one shaped like the alien gauntlet gun that the Lonergan character wields throughout the film, which became a popular item among the small but dedicated group of Cowboys & Aliens cosplayers. Whatever problems one may have with the movie, it's hard to deny Favreau and company found an elegant and unobtrusive form of corporate promotion. Plus, we can rest easy knowing that the descendants of Absolution's alien-fighting residents will someday have a place to buy lottery tickets and Krispy Kreme donuts.